Review Microsoft must be rattled by the steady decline in the market share of Internet Explorer. Worldwide it has gone from 68.5 per cent in July 2008 to 46 per cent today, according to StatCounter. Does IE9 have what it takes to stop Microsoft's market share bleeding away, or even to win back users? Here is a quick look at the pros can cons. IE9 JumpLists: non-standard HTML metatags. On the plus side, the RC feels smoother and trips up less often than the beta, judging from my tests so far. New HTML5 features include support for the Geolocation API, video tag using the Google-sponsored WebM video codec if it is installed, CCSS3 2D transforms, and accessible media controls. There are several usability refinements. You can now optionally place tabs on a separate row below the One Box, a small point but one that makes multiple open tabs easier to manage. Pressing the Alt key toggles the IE9 menu bar, which is another handy feature. The biggest changes are in security and privacy. ActiveX filtering prevents all ActiveX controls from running, unless enabled on a site-by-site basis. This is great for security; though perplexing for less technical users, since only a small blue icon in the One Box shows when it is active. I used Adobe web conferencing with this feature enabled, for example. Although the latest Flash was already installed, the conferencing site automatically directed the browser to the Flash download site. This kind of usability issue is probably why the feature is off by default, which means it will not help the less technical users who most need it. Tracking Protection is also off by default. This feature lets you block specified sites from tracking your web activity, saving you from annoyances like the same ads appearing on every site. You can download blocking lists from third-parties, making this feature easy to use. 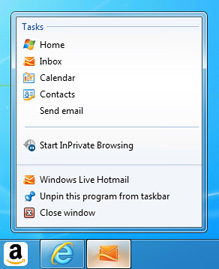 Site pinning, which adds shortcuts to the Windows 7 taskbar, is improved in this release. Developers can add code to web pages that lets users drag an in-page image, making this feature easier for sites to promote. Pinning is a neat feature for frequently used sites. Pinning is controversial though. Pinned web sites support JumpLists, shortcuts to important pages within the pinned site, and these are enabled by meta tags within the HTML. When the feature appeared in the IE9 preview, some argued that Microsoft should have used the standard <menu> element instead of "msapplication" data that is only relevant on Windows. Fair point, and look how Drupal developer Gerhard Killesreiter responded when a user of this open source content management systems asked for it to be supported: "The only status is the "won't fix" one. We'll not join Microsoft in perverting the net again." It is worth mentioning, because Microsoft has form, as the company which froze web standards for years and cares only about Windows. Although IE9 now delivers great improvement in standard support, it will not easily win over developers who observed the damage that was done. While HTML5 support in IE9 is real and significant, it is not as comprehensive as the company's publicity implies. According to one test site [http://www.html5test.com], IE9 RC scores just 116, compared to 207 for Safari 5.0 and 244 for Chrome 10, in my tests. Microsoft's development process is too slow. IE9 was announced at the Mix conference in March 2010, nearly a year ago. It has only just reached RC, and looks less impressive now because competing browsers have improved. Although IE9 is generally pleasant to use, it is hard to configure because options are strewn all over the user interface. Some are in the Internet Options dialog, some are on the settings menu, some, like Show tabs on a separate row, are right-click menus. The RSS icon is now deeply hidden, since you have to make the command bar visible first. Despite these reservations, IE9 is a remarkable improvement over IE8, even in RC form. It is fast and polished. The ActiveX filtering and Tracking Protection features are distinctive and excellent, though unfortunately off by default. Pinned sites work well, though only Windows 7 users benefit; and note that IE9 does not work at all on Windows XP. The developer tools, available by pressing F12, are superb, and now include the ability to change the user agent string. Network traffic capture is built in.